The Fowler Museum, located at UCLA is now displaying a three-part exhibition based on Brazil’s African history and cultural heritage. Pacific Standard Time: LA/LA is surveying Latin American and Latino art. It is also collaborating with various art institutions all over Southern California. Pacific Standard Time: LA/LA is presenting Southern California with significant art exhibitions about the ancient world and pre-modern era. Its exhibits range from topics about the luxurious goods in the pre-Columbian era to Latino artists boundary crossing practices. “Axé Bahia: The Power of Art in Afro-Brazilian Metropolis”, one of the three exhibits, will be showcased from September 24 to April 15, 2018. The Axé Bahia exhibit’s curatorial team was led by Patrick Polk, Fowler’s curator of Latin America and Caribbean popular arts, in corroboration with other co-curators such as Roberto Conduru (a professor of art history and theory at Rio de Janeiro State University), Sabrina Gledhill (a Brazil-based scholar of Bahian history and culture), and Randal Johnson (a Spanish and Portuguese professor at UCLA). The exhibit factors various pieces of work from modern and contemporary artists like Mário Neto, Rubem Valentim, Pierre Verger, Rommulo Conceição, Caetano Dias, Helemozão, Heráclito, and so on. It explores distinct cultural identities of Salvador, Bahia as well as the complex issues of race and cultural affiliation in Brazil with Afro-Brazilian art from the mid-20th century to present times. The exhibition also investigates how art including sculptures, paintings, photographs, videos, and three-dimensional works are expressed to shape and broaden Bahian identity and experience. Some of these visuals portray a strong and provocative response to slavery and present forms of discrimination. Caetano Dias, a Brazilian visual artist built Delirios de Cathrina (The Ravings of Catherine), a contradicting artwork made out of wood, metal, sugar, ox blood, and resin which differentiates the pleasant taste of sugar to the pungent bitterness of sugarcane production in Brazil. The Ravings of Catherine includes a merge of two distinct tables, one made out of wood and the other of blood. The table made out of wood incorporates metal into its composition, it is a worn down white rectangular work table where the enslaved labored. The table made out of ox’s blood is round and extremely detailed, contrarily it is where slaveholders ate. The piece also includes a large amount of African dismembered human heads made out of sugar. 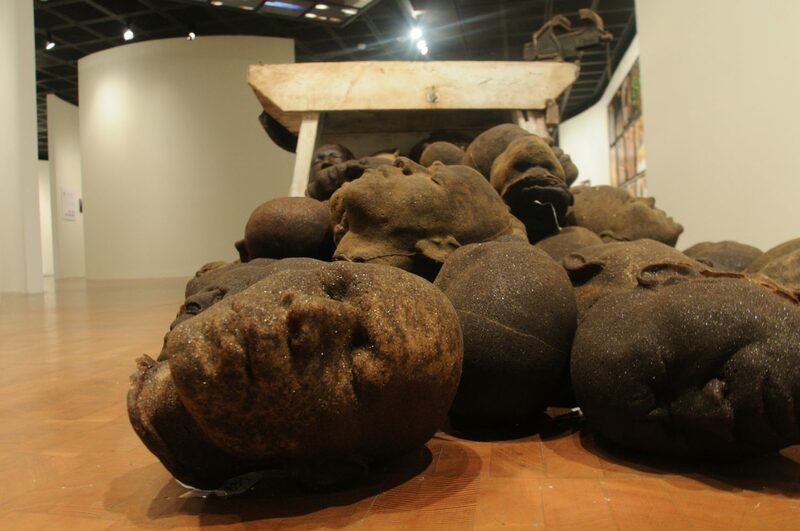 The heads are placed underneath the worker’s table and spread out among the museum’s floor to indicate the exploitation of slaves in large colonial farms. 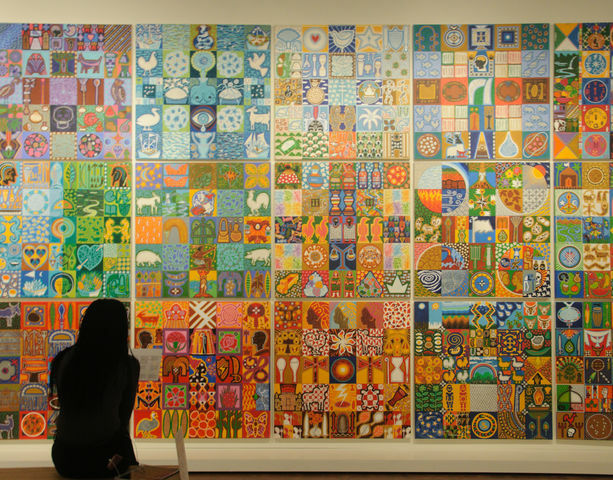 The Axé Bahia exhibit also displays Jose Cunha’s collection of painted canvases called Códice (Codex) on the museum’s wall. In order to comprehend Cunha’s work, it must be read from left to right and bottom to top. The collection has 21 panels each depicting the central beliefs of Candomblé and Umbanda, two different Afro-Brazilian religions. The canvases portray mythological tales and historical events of orixás (saints) and other supernatural beings. The 13th panel is of Tempo, a personified figure of time and the seasons. Tempo’s canvas is a multi-colored painting that associates him with the Earth’s 4 elements (earth, water, air, and fire), its seasons (spring, summer, fall, and winter), natural geographical features, and the stages of human life. The Axé Bahia exhibit gives visitors the chance to learn about the importance of the culture in Salvador by showing off a broad spectrum of creative Afro-Brazilian practices as well as the history of Latin America. With this exhibit, Pacific Standard Time: LA/LA brings awareness to a complex set of issues about the current relations in the Americas and Southern California’s altering social and cultural infrastructure.